Private Tutor Business Plan in Nigeria – If you have a passion for teaching others then you can consider working as a self-employed private tutor. Working as a private tutor can be a rewarding job, not to mention a great way to earn a living being your own boss. What Qualifications do you need to become a Private Tutor? In Nigeria, there are no standard qualifications for private tutors so if you have good knowledge in a particular subject or field, you can become a tutor in that area. For example, if you are excellent at math, you can begin to offer your services as a math teacher. The same applies to other subjects. However, private tutoring is not just limited to teaching complex subjects to school students. Professional examinations like your ICAN, ICPM, CCNA, etc. It is very important to have patience and to have a genuine interest in working with younger people or those looking to learn a new skill. If you can motivate people to do better and you can also approach problems with enthusiasm then working as a private tutor can give you great job satisfaction. A friend of mine in Rivers State does Math lesson for 7 kids. These teenagers meet in her place three times in a week and she teaches them for two hours each day. Each student pays N20,000.00 as lesson fees for a month. Therefore she makes N140,000.00 each month. She can earn much more if she decides teach more kids. And so can you. A regular civil servant works 8 hours every day for 5 days a week (except Sunday) = 40 hours a week = 160 hours a month (i.e. 40hours X 4weeks) for a basic salary of N90, 000.00 a month. While my tutor friend works 2 hours every day for 6 days a week (except Sunday) = 12 hours every week and 48 hours a month (i.e. 12 hours X 4weeks) for N140, 000.00 a month. Do I need to ask you who is earning more and working less? The figures are there. The wonderful thing about private tutoring is that you can teach just about anything you want, be your own boss and still have a lot of time on your hands to do other things. Decide on the age group of the students you will tutor. Generally, it is easier to teach kids in primary and secondary school but tutoring older people is more financially rewarding. Just select a targeted market and focus on them. You can diversify as your tutoring business expands. Make a list of the subjects your tutoring business will offer. Be sure you have good knowledge and understanding on these subjects you offer. You don’t want to be asked a question you cannot answer. Research on various teaching techniques and settle on a few you’re good at. You will have to decide on where you will teach your clients – your home or your student’s homes. Most parents with young children prefer the lessons to take place in their home so that their child will be relaxed in a familiar environment. However, conducting lessons from your own home will save time, energy, money and you will be able to teach more sessions in a day. Purchase tutoring supplies. Such as text books, study guides, lesson/ lecture notes, paper/pens, writing board etc. Advertise your services in places where parents or clients frequent. If primary school kids are your targeted market, share your handbills and business card to parents at school gates as parents do “school run”. You can ask school administrators and other institutions to refer clients to you. Determine your student’s potential. 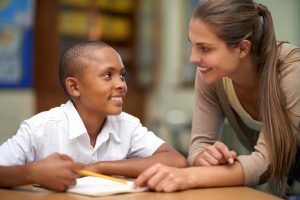 In order to figure out how best to help your student, you have to know who he is, what his interests are, and how he feels about the subject or subjects in which you’re tutoring him. Do not be a boring tutor; Make your lesson session exciting for your students with lots of examples and stories. Make them learn it the fun way! Keep parents informed about progress. Never inflate students’ abilities, but at the same time encourage them. Find out how much other tutors are charging and charge similar rates. Charging too little or too much may hinder your ability to find work. Know that patience and enthusiasm are major qualities that anyone who wants to be successful in the tutoring business must have. Without these, your students will not get better. Once the business starts to grow, hire more skilled tutors. You cannot do it on your own. Distribute fliers and brochures in primary and secondary schools, universities, libraries, churches, mosques, offices and in other places where parents meet. Introduce yourself to school administrators, teachers, counselors and anyone who can refer your services to interested parents. Invest in a professional website and advertise your services on Facebook, twitter and other social media platforms. However, the strongest and most influential form of advertising in this business is by word of mouth from students and families who are satisfied with your services. Get your own Private Tutor business plan in Nigeria here. This business plan can be used to apply for bank loan, seek out investors and be used for business plan competitions. To place order for your sample private tutor business plan in Nigeria, call us on: +2347033378184 or via email: hello@businessplan.com.ng. Go for it People! Start today! I wish to have a Clinic for English Language and Mathematics irrespective of the status of the clients- up to Advanced Level.It does not matter whether or not clients are examination candidates or self development targets. Hello, I would like to have a Private Tutor Business Plan.. Kindly send to me..